A military base is a facility directly owned and operated by or for the military or one of its branches that shelters military equipment and personnel, and facilitates training and operations. A military base provides accommodations for one or more units, but it may also be used as a command center, training ground or proving ground. In most cases, military bases rely on outside help to operate. However, certain complex bases are able to endure on their own for long periods because they are able to provide food, water and other life support necessities for their inhabitants while under siege. Military bases for military aviation are called military air bases. Military bases for military ships are called naval bases. Military bases within the United States are considered federal property and are subject to federal law. Civilians (such as family members of military officers) living on military bases are generally subject to the civil and criminal laws of the states where the bases are located. Military bases can range from small outposts to military cities containing up to 100,000 people. Military bases may belong to a different nation or state than the territory surrounding it. The name used generally refers to the type of military activity that takes place at the base. Depending on the context, the term 'military base' may refer to any establishment (usually permanent) that houses a nation's armed forces, or even organized paramilitary forces such as the Police, Constabulary, Militia, or Guards. Alternatively, the term may refer solely to an establishment which is used only by an army (or possibly other land fighting related forces, such as marines) to the exclusion of a base used by either an air force or a navy. This is consistent with the different meanings of the word 'military'. 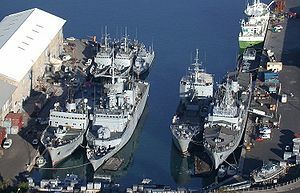 Some examples of permanent military bases used by the navies and air forces of the world are the HMNB Portsmouth in Portsmouth, UK, the Naval Air Station Whidbey Island, Washington State, USA, or Ramstein Air Base, Germany (the last two are each designated as a Main Operating Base). Other examples of non- or semi-permanent military bases include a Forward Operating Base (FOB), a Logistics Base (Log base) and a Fire Base (FB). A military base may also contain large concentrations of military supplies in order to support military logistics. Most military bases are restricted to the public and usually only authorized personnel may enter them (be it military personnel or their relatives and authorized civilian personnel). In addition to the main military facilities on a certain installation, military bases usually (but not always) have various different facilities for military personnel. These facilities vary from country to country. Military bases can provide housing for military personnel, a post office and dining facilities (Restaurants). They may also provide support facilities such as fast food restaurants, gas stations, chapels, schools, banks, thrift stores, a hospital or clinic (dental or health clinics, as well as veterinarian clinics), lodging, movie theaters, and retail stores (usually a Supermarket such as Commissary and a Department Store, such as AAFES). Family, Morale, Welfare and Recreation (FMWR) provides facilities such as fitness centers, libraries, golf courses, Travel centers, Community service centers, Campgrounds, child development centers, youth centers, automotive workshops, hobby/arts and crafts centers, bowling centers, and community centers. In Russian usage "military base" or "naval base" is not limited to denoting a specific fence described facility and usually encompasses a broad territory within which a number of discrete facilities may be located. As an examples, 1) the Russian Sevastopol Naval Base comprises individual facilities located within the city of Sevastopol proper (waterfront moorings, weapons stores, a headquarters compound, and a naval infantry base) as well as an airfield at Kacha north of the city; 2) the Leningrad Naval Base comprises all naval facilities in the greater St. Petersburg area including training schools, commissioning institutes, the naval academy, and the Kronshtadt base on Kotlin island. An overseas military base is a military base that is geographically located outside of the territory of the country whose armed forces are the principal occupants of the base. The use of overseas military base has throughout its history of usage been a contentious issue of debate, and is often a source of opposition for antimilitarists and nationalists in the host country. Such bases may be established by treaties between the governing power in the host country and another country which needs to establish the military base in the host country for various reasons, usually strategic and logistic. Furthermore, overseas military bases often serve as the source of the military brat subculture due to the children of the bases' occupant military being born or raised in the host country but raised with a remote parental knowledge of the occupant military's home country. In the 18th and 19th Centuries the Royal Engineers were largely responsible for erecting military bases in the British Isles and the British Empire. In 1792 the Chief Engineer was instructed to prepare the Barrack Construction estimates for Parliament and at the same time the Department of the Barrackmaster-General was established. The Cardwell Reforms (1872) ushered in another period of intensive Barrack building at Aldershot, Portsmouth, Plymouth, London, Woking, Woolwich, Dublin, Belfast, Malta, Gibraltar and the Cape of Good Hope. In 1959 the Corps' Work Services was transferred to the civilian War Department Works Organization (later renamed Property Services Agency (PSA)) and by 1965 the (Specialist Teams Royal Engineers (STRE)) were formed to plan and execute Works projects worldwide. British naval bases are traditionally named, commissioned, and administered as though they were naval ships. For this reason they are sometimes called stone frigates. ^ Thackrah, J. R. (April 3, 2018). "Military base definition". Collins English Dictionary. Retrieved April 3, 2018. ^ "Smoke a Joint in the These States, But Not On Base". Military.com. 2016-11-25. Retrieved 2018-04-09. Wikimedia Commons has media related to Military bases. Official Directory of US Military bases.